Craig Lieberman, Aimee Shackelford and Benjamin Chen are some creative people. 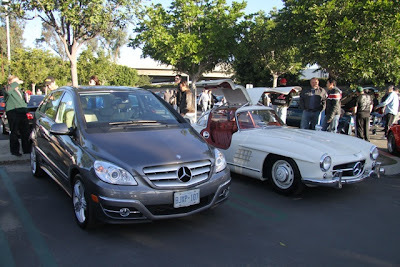 They organize drives for exotic car owners under the L4P banner and other events that bring the well-heeled – and well-wheeled – together to have a little fun with their rides. Their latest gathering added a little twist, as the typical run ended not at a restaurant as usual, but at the Lyon Air Museum, a World War II museum that houses some amazing aircraft. While the organizers had anticipated about 50 Lamborghinis, Ferraris, Porsches and the like... more than twice as many actually turned up. That made for some creative parking solutions. 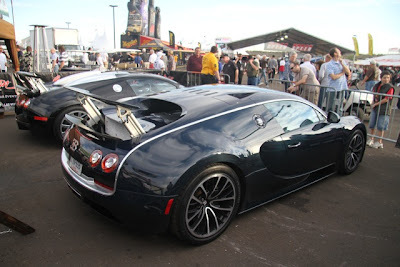 While the hottest cars, like the black Enzo, got prime spots right in front of the museum entrance, the modified BMWs and Benzes filled in the access road and outer lots of the adjacent businesses. They left spots for the Chomp Chomp food truck and the ice cream truck too thankfully. 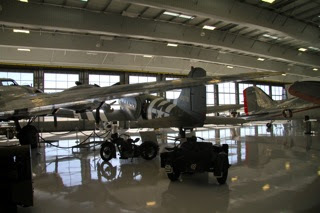 Inside the museum, folks got to see a B17 bomber (think Memphis Belle), an A26 Invader and a C47 (think Band of Brothers) as well as several armored military vehicles and classic automobiles. Only a couple of classics were parked outside the museum, but they were pretty great too. 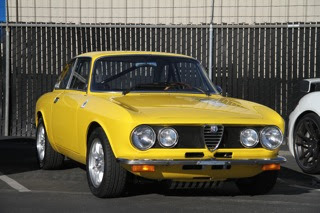 The yellow Alfa was stunning. 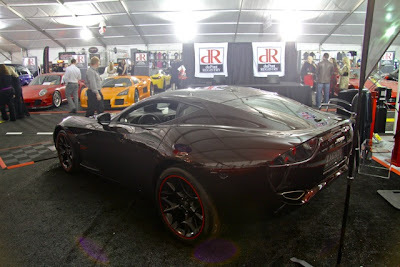 Of the modern cars, the Enzo was definitely at the top of the roster, but there were dozens of others that stood out. 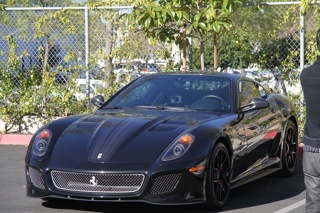 Ferraris included a 599 GTO and "regular" GTB, Stradale, and satin black 430 Spider with more than 80,000 miles on it. The sign of the bull was well represented too, with everything from a Diablo 6.0 to a half dozen Murcielagos. There were Superleggeras, a Valentino Balboni and plenty of regular Gallardos too. The Lexus guys brought a yellow LFA, Mercedes had an SLS AMG, SL65 Black, CLK Black, and about a dozen other AMG and tuner models, Acura NSX, Honda S200, Lotus Elise, Dodge Viper, Corvettes, Porsche Panamera, Cayenne, 914, 911 and Caymans, Evos, STIs, GTRs, Bentley Continental GT SuperSports, Audi R8, Cadillac CTS-V Coupe, Spyker C8 Spyder, Ariel Atom, E-Type and on and on. Personal tips of the hat to the best license plate "CLKWORK" on an Orange Murci, the original Mini Cooper, R33 GTR, Lincoln Continental convertible, and the BMW M5 that had by far the most appropriate paintjob for the setting, camo and noseart. Big gathering of C4 ZR-1 Corvettes today, as well as a bunch of cool old Alfas, Lancias and Lotus Esprits. But the highlight had to be the car I saw after I heard someone call out, "Clio!" 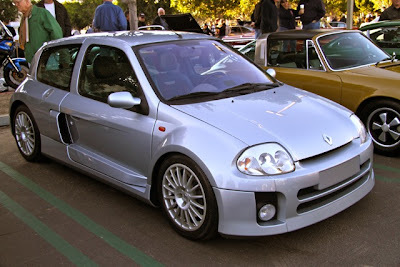 Yep, our favorite gray market Frankenhatch was back, the mid-engined, flared-fendered V6 by Renault Sport. And if that wasn't enough, just as we were leaving, another cry came. This time it was, "LM002!" Uh huh, the Rambo Lambo was back. The Lamborghini SUV that was originally developed to be an Italian military vehicle. Sort of an Italian Hummer. This red one looked great, and just as badass as I remembered it. Other notables today included the purple Lamborghini Diablo SE, white Ferrari 612, Audi Quattro, Sunny, E30 M3s, old Rolls Royces, Jags and MGs, and some great bikes. It never ceases to amaze me how big this place really is. It has to be a mile from one end of the main tent to the other, and that doesn't include the acres and acres of auxiliary tents, vendor booths and demonstration areas. Not to mention the parking, which isn't always, shall we say, tent-adjacent. Still, it's worth the exercise to see so many truly amazing displays of automotive history and modern tuning magic in the flesh. It's a fun place to people watch too, but the cars are really the big attraction, even to car guys jaded from free local shows like Cars & Coffee. While many of the listings in the auction catalog read like a Who's Who of obscure and legendary muscle cars, European classics and star cars, there are quite a few mundane autos in the book to mirror the truly outrageous customs that are truly their owners' prides and joys. Even if I have to fight a severe gag reflex whenever I see one. Did you catch the auction action on Speed at all on Wednesday? That Brillante Corvette with its Testarossa wannabe looks was truly puke-tastic, and yet...it sold for more than some of the stock C3 and C4 Vettes in the same day. Different strokes I guess. Some of the best vehicles in the offerings will be going across the block on Friday and Saturday during prime time, but there are quite a few nice cars scattered throughout the early days too. I feel bad for the folks who have their cars going through at those times though because the bidders just aren't the same caliber as the weekend ones. There were so many steals on Tuesday and Wednesday that I had to fight the impulse to register for a bidders paddle. I'll have hundreds of additional pics posted soon of the cars, the VIP party where they launched the 40th Anniversary Perana and David Yurman watch, and of the fashion show that accompanied that event. 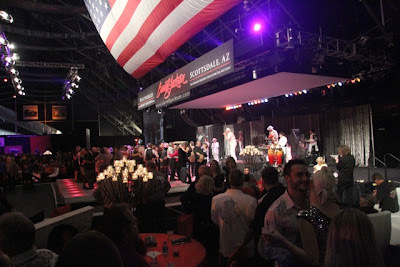 It was a fun night with great food, an open bar, swimsuit models and one stunning car. 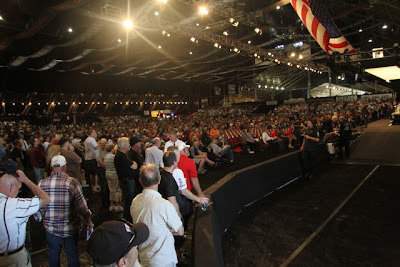 Check back soon for more updates from Barrett-Jackson. 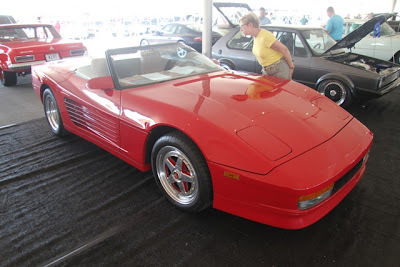 It's been a couple of years since I've made it out to this ginormous classic car auction, sorry...event, at West World in Scottsdale, Arizona, but it's exactly as I remembered it. After a five-and-a-half hour drive from Orange County on Monday morning, the huge tents and structures that make up this amazing three ring circus of classic and collectible cars came into view. Even before the actual show begins, the amount of activity is incredible. Hundreds, if not thousands, of workers are scurrying about, making last minute preparations for the anticipated 185,000 folks who will be headed down for the nearly weeklong event. I had made it down just in time to miss the media credentialing reps who had taken a break to change for that night's Gala reception. No worries – after walking the half mile from one end of the tent to the other and back, I finally had what I needed and even a few extra minutes before the soiree started to change out of my road clothes. I met up with Lance, Deborah and the rest of the Superformance/Shelby Distribution gang and headed in. I followed them over to see their newest offering. The new 40th Anniversary Edition Perana Z-one looks absolutely amazing in its black cherry metallic pearl paint. It looks almost root bear brown in certain light but shifts to plum and even black in shadowed areas. It's stunning. After spending about an hour in the Sherwin-Williams booth where the car is parked, I can tell you I wasn't the only one who thought so. Dozens of people stopped to say pretty much the same thing over and over, "That is so beautiful. What is it?" The Perana Z-one is a Zagato concept come to life. To celebrate their 90th year in automotive design, the Milanese coachbuilder decided to design something for themselves instead of for Aston Martin, Lancia, Alfa Romeo or Ferrari like they've done in the past. 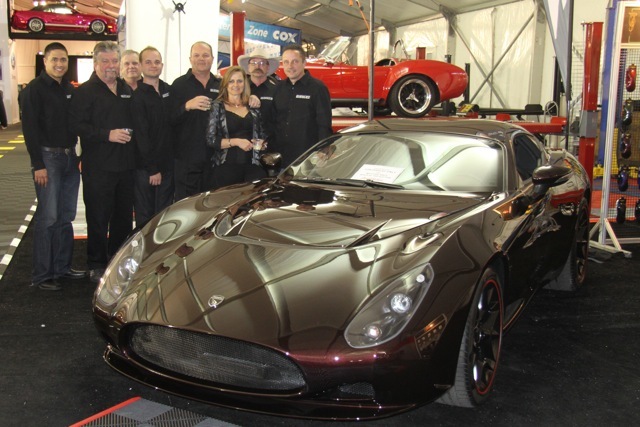 The response to the Z-one show car was so great that they looked for a way to build it. 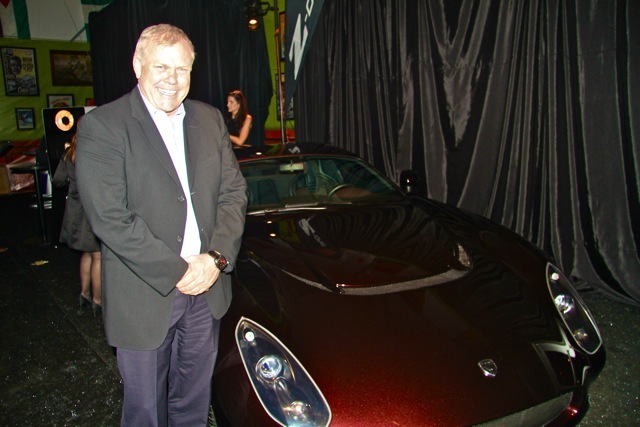 They eventually found Hi Tech in South Africa, the firm that engineers and builds the Noble, Fenix and Superformance vehicles for those car companies. Hi Tech is one of the only low volume production facilities in the world, so it was a natural fit. The Perana Z-one is being handled by Superformance Distribution in the States and will be limited to just 99 units annually. 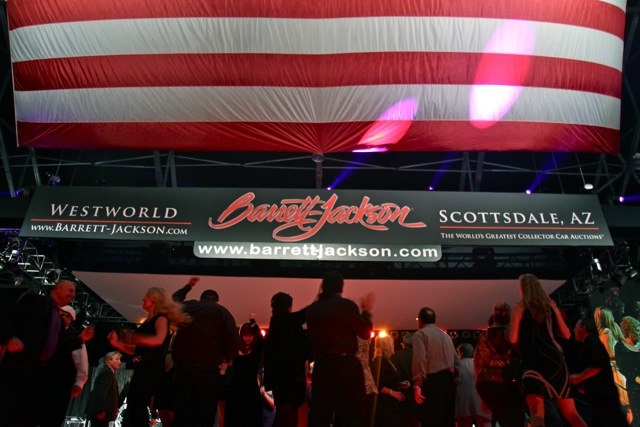 The particular car on display at Barrett-Jackson this year is a car commissioned by B-J to celebrate their own 40th Anniversary in business. The special edition features that special Planet Color black cherry paint from Sherwin-Williams, as well as B-J logo black and red wheels. It also comes with a specially commissioned David Yurman watch. Just 40 will be sold. This week is the car's official debut and it will be featured at a special VIP event on Wednesday night. 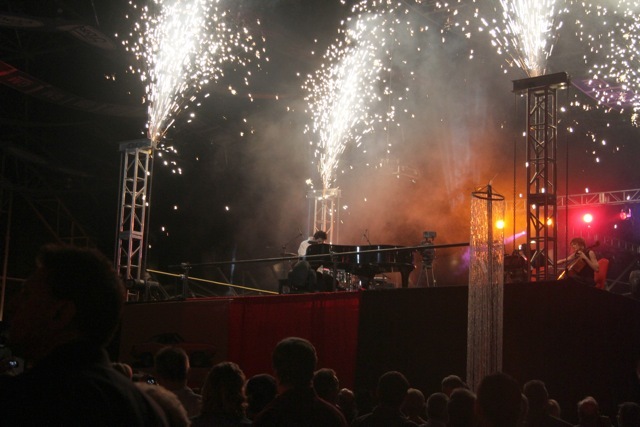 This night's party was pretty incredible, with live music, dancing, fireworks, and Craig Jackson himself presiding over a slide show. Nothing like torturing a captive audience. Actually it was short and sweet. He wanted to hammer home (get it? it's an auction) the idea that they aren't just a car auction company. They are also car collectors. He showed images from his youth and the very same cars from those images were on the stage, proving he can't seem to get rid of anything. Dialing Hoarders now. 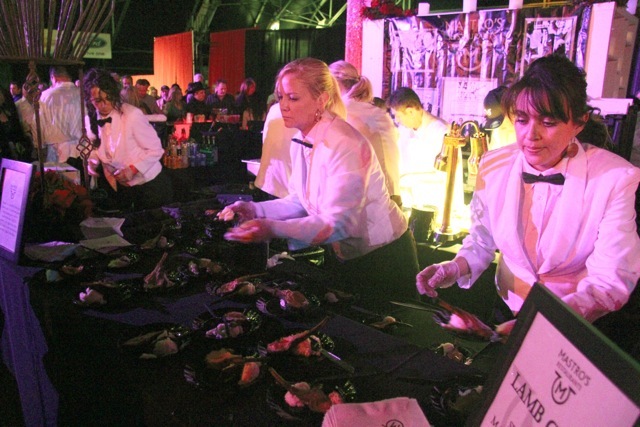 The other great part of these galas is the food and drink. Open bar and lovely little samplings of everything from Cold Stone Ice Cream to Mastro's lamb chops. The lobster bisque shooters were particularly noteworthy. Lots of cute girls circulating through the crowds handing out champagne all night too and plenty more lovely ladies of all ages taking advantage of the festive opportunity to showcase their Golden Globes...worthy dresses, with plunging necklines and fallopian tube revealing hemlines. Seriously, what are some of these gals thinking? Not that anyone was complaining, mind you. I haven't had a chance to check out many of the auction offerings yet, but that's what today will be for. Watch this space for further postings from 2011 B-J Scottsdale. For now, check out the pics from last night. Quite possibly the biggest show ever at C&C this week, probably due in part to AutoWeek's coverage of last week's boffo show and partly due to the incredible weather. No featured marque needed this week to draw probably 600 cars. At quarter past seven both the main lot and the side lot were overflowing with vehicular goodness and the spectator lot was now getting the leftover Ferraris, Lotuses, Porsches and the like. The usual incredible assortment of eclectic motoring tastes were being pushed to the envelope this week, with a Toronto couple's B-Series Mercedes vying for attention with a genuine '54 Gullwing parked beside it. 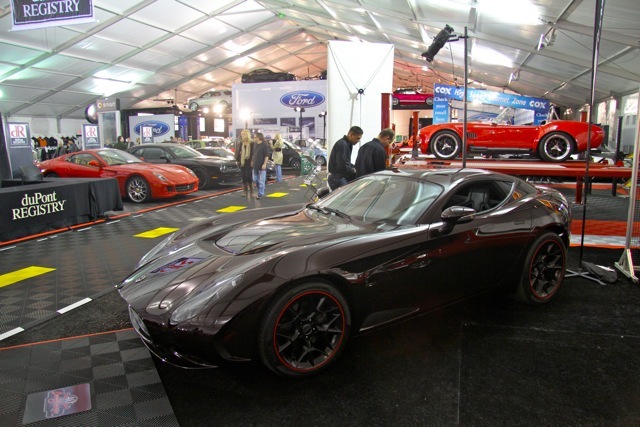 A Ford Raptor and a Ferrari 328, D-Type Jag and John Travolta's old E-Type, a Maranello and a 400i, a GT500 and a Ford GT and a real Convertible and faux convertible XJS were some other interesting pairings. Individual highlights included the Mercedes 220 SE, Ferrari 330 GTC, VW 1500 Notchback, Baja Bug, '56 Chevy Nomad, Morgan AeroMax, ultra-clean Porsche 928 GTS, gray Ferrari 599 Fiorano, Buick Regal T-Type, Lambo Superleggera, '66 Buick Riviera, BMW 2002 Tii Turbo, Alfa Romeo Giulia Sprint GT, Cuisinart-wheeled Viper, and all of the GT-Rs, Porsche Turbos and Hot Rods. The Ferraris were a mixed group of returnees and newcomers. The No. 344 barchetta is a special 166 MM that is being auctioned at RM soon. The blue Europa was a prized GT with the Lampredi V12. Two TdFs, a Daytona, 275GTB/4, Superfast, Dino, two Lussos, a 166 MM (? ), and John's Pinin Farina Series I Cab were the highlights, but there were plenty of other Ferraris too: F50, Enzo, Dino 308 GT4, Boxer, 599, Maranellos, 355s, 430s, 360s, and those Italias! I'd personally take the red one, but that Cream colored one certainly stands out. 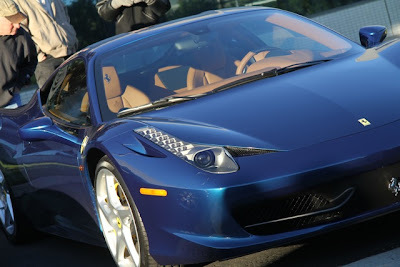 It's from the Classic Color collection that Ferrari reintroduced back in 2007. It's called Avorio by the way. That new Italia sure looks good in blue. The LFA doesn't look quite as good in yellow, to my eye at least. Tom's TdF, on the other hand, looks good even covered in dirt. The first show of the new year - and a new decade - was a bit light, but there were quite a few dream cars in the mix: A Noble M400, 911 Turbo S, Ford GT, Daytona, Carrera RS, GT3 RS, DBS, Dino, 308, Panteras, Exige, Elise, Isetta, Split-Window Corvette, Bugeye, Triumph, GTR, Murci, RUF, Pinkie, 454 Corvette, Z06, NSX, GT500 and a pack of Boss 302s to name a few. Best wishes for a happy, safe and prosperous New Year to all of you and thanks for continuing to support the site. 2011 should be a big year.